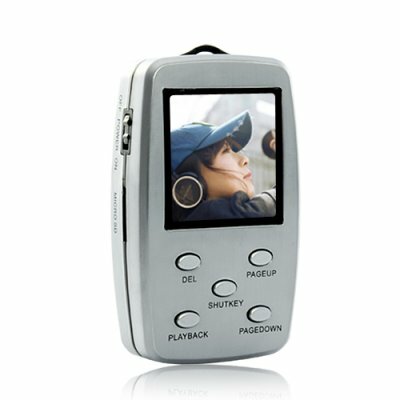 Successfully Added Point and Shoot Mini Camcorder with Viewing Screen to your Shopping Cart. Capture high quality video conveniently with this incredibly compact Point and Shoot Mini Camcorder with Viewing Screen. What is cool with modernity and state-of-the-art technologies is that electronic devices are becoming so powerful and small at the same time! Miniaturization is one of the best inventions, which makes our daily life easier and better. And the Mini Camcorder, in this concept, has been designed to be a high definition pocket image recorder. Indeed this Mini DVR delivers great video performance at 640x480 30FPS and high resolution photos at 1280x960. Altogether with a large LCD working as a viewfinder you will be able to point whatever you want, get the perfect viewing angle and shoot quickly for a pretty result. Considering its mini size, super light weight and elegant design, this ultra portable Mini Camcorder will fit perfectly in your hand but also in any pocket or bag. When something catches your attention, take the Mini DVR out, record and put it back in its original location in a handful of seconds. As every instant is unique there is no time to waste on settings! Much more convenient to carry than normal size cameras and other video recorders, the Mini Camcorder will follow you everywhere. In amusement parks, overcrowded places, temples… Wherever you usually hesitate before bringing or taking out your recording gadget! Using the Mini DVR as a car DVR is another interesting feature. Thanks to the mounting kit included in the whole set, place it on your windshield or on top of the dashboard to accurately document evidence for insurance purposes, court, proof of an officer’s abusive behavior or just for getting memories of beautiful landscapes while driving! From now on catch any moment in your life with the Mini Camcorder and without breaking the bank to do so. Order quickly while supplies last and we will express ship your new mini DVR with LCD and include our famous one year warranty.